If we let the media get away with this, they will have once again redefined what constitutes acceptable discourse in America and cemented the notion that our political process should never be soiled by such a campaign ad — the one thing Bush got right in his entire public career. Twelve hours after he had first encountered Horton, Barnes managed to escape. When Horton realized Barnes was gone, he stole the couple’s car and led police on a high-speed chase before finally being captured — again. 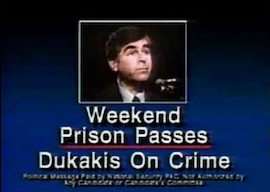 Dukakis was directly responsible for Horton’s release — as well as the release of hundreds of other murderers, many of whom went on to commit similarly heinous crimes. Even Dukakis’ own Democratic legislature in liberal Massachusetts had tried to reverse a state Supreme Court decision granting furloughs to first-degree murderers. Yes I am! It demonstrated that Michael Dukakis should have never been anywhere near a position of power, least of all, the presidency. What’s your argument against it?